elcome to our March issue. It is hard to believe that we are now into March and Autumn is here! 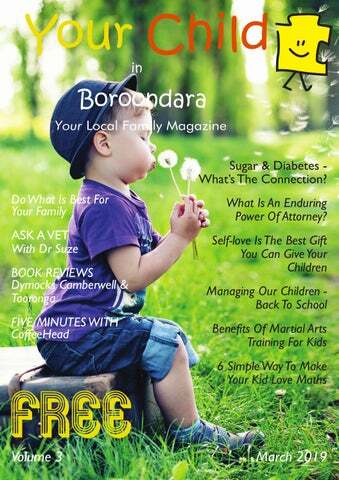 In this issue, we have some interesting reads: 6 Simple Ways To Make Your Kid Love Maths, Managing Our Children-Back To School, What Is An Enduring Power Of Attorney?, Sugar & Diabetes-What’s The Connection? and a few more. Has your child had his/her eyes checked yet? Ashburton Eyecare (Ashburton), In2Eyes Optometry (Surrey Hills) & The Optometrist (Stockland Tooronga) specialise in children eyecare. Why Print Ads & Your Child in Boroondara? Schools are now planning for next year’s enrolment. Contact these reputable schools to find out more about enrolment and opportunities for your child - Ruyton Girls School (Kew), Erasmus Primary (Hawthorn) & Belle Vue Primary (Balwyn North). If your child in interested in learning a new language, Victorian School of Languages has over 50 languages to choose from. Think Smart offers quality school readiness and tuition programs and Wonder Education has a variety of educational programs and activities for your little ones. Mums and Dads, keep healthy and fit this year with a range of machine-assisted Pilates equipment at Be In Shape. Also good time to give your home loan a free health check with Aussie Ashburton and find out how you can save. Bedisson Gardens Designs offers landscape design plans, garden consultations & plant selections for a beautiful garden. Head down with the whole family for a fabulous family meal at CoffeeHead where kids eat for free on Saturdays. CoffeHead is ‘Five Minutes With’ feature this month. Dymocks Camberwell & Tooronga bring us 4 fabulous book reviews and you can get them in store or online. Shop online at Oeteo Australia for functional and unique baby apparel. Little Creatures and Base Camp Kids are two excellent options to consider for your child’s next party at their awesome party venues. Fizz Kids Klub is taking booking for Term 2 educational After-School Science programs. Sign up early as places are limited. We hope you have a great month and till next issue in April! We are pleased to bring you COFFEEHEAD in this issue of FIVE MINUTES WITH. Run and owned by Ash and Shiroma Nathan and Bill Sibonis, CoffeeHead has been in Camberwell for more than 7 years. Last October, CoffeeHead launched PizzaHead, its pizzeria menu of gourmet wood-ﬁred pizzas. q Camberwell has many eateries and coffee shops. What sets CoffeeHead apart from the others? We are ﬁrst and foremost a comfortable and friendly environment, where families, couples, the old, the young and people from all walks of life are welcomed to dine and enjoy good quality food and exceptional in house roasted coffee at reasonable prices. We believe exceptional service, quality coffee and food in a friendly welcoming atmosphere is what hospitality is all about. q CoffeeHead is an established business for over seven years. How has it evolved? When it ﬁrst opened, we concentrated on being just a coffee warehouse and roaster but realised people wanted food too. So we became a cafe as well and decided to concentrate on our own coffees which were outselling the others. Last year, after getting a liquor license, we decided to open Friday and Saturday nights and more recently a wood ﬁred pizza oven was built to offer a completely different dinning experience on the nights. So now we are CoffeeHead by day and PizzaHead by night. q Tell us about your new PizzaHead menu. A couple of the pizzas were inspired by a visit to New York by Shiroma who visited Brooklyn's best pizzeria Roberta's, that ironically reminded her of CoffeeHead's vibe. We use the best Italian ingredients from Naples to keep it authentic. The dough recipe was handed down by a family recipe from Naples that Ash tweaked and gets great feedback. On Saturday nights kids eat free. If you prefer to stay at home our PizzaHead menu is available via Uber Eats. q What things may customers not know about CoffeeHead/PizzaHead? We sell coffee beans to wholesale customers and ofﬁces. Our blends also come in Nespresso compatible pods and taste amazing as they're not mass produced.The beans are available on Uber Eats.We hire out the café for functions with no hire costs and can tailor make a menu to suit all requirements.We do office catering. ASK A VET with Dr Suze Why does my cat drool? Cats can drool for many reasons, some benign but some may be cause for further investigation.Drooling or hyper-salivation can be a sign of contentment and relaxation, particularly if this occurs whilst your pet is kneading or purring. In kittens, kneading with paws stimulates milk let down during nursing and thus reinforces feelings of comfort, satiety and contentment.This behavioural association can carry forward into adulthood and are signs of a happy cat. Cat's don't typically salivate at the sight or smell of food but for some particularly food motivated cats this may occur. Stressful and fearful situations can also trigger excessive salivation in some cats, car journeys and trips to the vets can be classic triggers.The aforementioned are all perfectly normal feline responses to their environment, they are short lived, self-limiting and require no specific treatment. Hyper-salivation may also be a sign of underlying illness or disease process, especially if it is in combination with other clinical signs. For example, bad breath, a preference for soft foods/reduced appetite, reduced grooming and sensitivity around the face may indicate dental disease or other oral issues. Like people increased salivation can be a sign of nausea or exposure to a toxin or an irritant. If your cat is drooling and displaying other abnormal clinical signs, then it is best to get it checked out by your local veterinarian. Our new puppy arrives in a few days when should I book in for his first vet appointment? The minimum age for puppies to be rehomed is around 7 to 8 weeks of age. This means that most puppies have already received their first 6-8 week puppy vaccination with the breeder but it's always worth double checking. It is a good idea to get any new pet thoroughly checked by your local veterinarian soon after joining the household. The purpose of this first visit is to ensure your new family member is enjoying optimal health. It is also a great opportunity to check that your new pet is receiving an appropriate diet for it's life stage as well as running through important health information such as worming and flea prevention. Dr. SusannaÂ Gamage BVSc MRCVS has over a decade of international veterinary experience and is the founding director of Dr. Suze - My Visiting Vet. If you have general pet question you would like answered by Dr. Suze please email susanna@drsuzemyvisitingvet.com.au. Please note the information in this article is of a general nature and is not intended to be a substitute for professional healthcare advice. If you have specific concerns about your pet, you should always seek advice directly from your veterinary healthcare practitioner. The Cook and the King by Julia Donaldson and David Roberts There once was a very hungry king who needed a cook like anything . . . . . . but the king is very fussy; he tries all the cooks in the kingdom, but no one is good enough.Then he spots Wobbly Bob. Maybe Bob can whip up his favourite dinner? But how will Bob be able to cook for the king when he's scared of . . . well, everything?! Discover how the hungry king helps Wobbly Bob face his fears on a cooking adventure across the land and sea. The Cook and the King is brilliantly funny, with rhyming verse and richly detailed illustrations. It is sure to become a firm favourite with children and adults alike. Under the Southern Cross by Frane Lessac Night-time in Australia, animals are waking, people are exploring, discoveries are being made - under the Southern Cross. What makes ribbons of colour swirl in the sky? What are the spooky balls of light that bounce across the outback? What animal lays eggs that look like squishy ping-pong balls? Where can you watch a movie with bats circling overhead? Discover the answers to these questions and more in this factastic tour of Australia after dark. A Dog Named Doug by Karma Wilson and Matt Myers Dogs love to dig but one dog named Doug takes digging to new heights (and depths) in this laugh-out-loud picture book. Meet Doug. Doug is a dog that loves to dig. But when Doug digs he doesn't just dig holes in the backyard. He digs…ditches the size of tractors! He digs…tunnels through gold mines! He even digs his way into…the White House! But not even the Secret Service can stop this digging doggy, because when Doug digs, oh boy, does Doug DIG! Childcare at Balwyn Community Centre Childcare at Balwyn Community Centre provides a warm, nurturing environment for your child to thrive! Our stimulating program fosters a love of learning, a sense of self and feelings of security. Your Child in Boroondara takes no responsibility for any statements or claims made by advertisers or authors. All material in Your Child Magazines is Copyright and may not be reproduced without written consent of the publisher.